So many companies out there go above and beyond to help the environment – why not learn more about them? Hop around the Earth Day Event and learn about great businesses and their products, and enter to win some awesome giveaways. Over 60 bloggers have prizes valued at $25+. Make sure to visit every blog for more chances to win. Eco-Foil even provided a Kindle Fire ($199 value) as a grand price. In order to win it – you need to enter some giveaways (the more you enter – the more entries you earn)! Take a moment – visit Eco-Foil and look for 100% recycled disposable aluminum pans at the local stores. Enter to win my giveaway on the Rafflecopter form below. 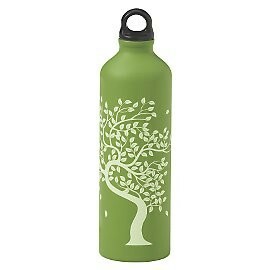 I have two great prizes for you: a Gaiam Tree of Life Stainless Steel Water Bottle and a package of 10 TrueBody Soaps (6 body bars and 4 face bars). To enter, just follow the directions on the Rafflecopter form. Giveaway ends April 22nd at 11:59PM, and is open to continental US residents 18+. Winner will be notified by email and has 48 hours to respond. Void where prohibited. Disclaimer: Please note that Pretty Opinionated, “Earth Day Giveaway Event” or the “Earth Day Event” bloggers are not responsible for sponsors that do not fulfill their prizes. We have represented each sponsor with the expectation they will fulfill their prize and in a timely manner. We will contact the sponsor regarding your prize(s). The sponsors, in most cases, are shipping their items to you directly. We will make every effort to assist you obtaining your prize. If there is an issue with a sponsor, please notify the blog you won a prize from within 4-6 weeks for assistance, after that we may be unable to assist you. I use reusable water bottles. I always bring tote bags to grocery shop and I recycle whenever possible. I rarely buy new if I can buy used. I recycle everything that I can and I offer up items I no longer need to others instead of throwing them away. We cloth diaper our twin boys! We recycle and reuse whenever possible. I use reusable bags at the grocery store. I don’t buy bottled water–I use refillable bottles. I also don’t use plastic utensils. I always carry a spoon and fork with me. I refill my water bottle and always recycle. I subscribed RSS Google Reader as Maryann D.
I use a water filter for drinking water. I also use Skoy clothes for washing and drying instead of paper towels. Building a composter this weekend. I have totes I take to the grocery store. I try to reuse as many things as I can. I recycle and try to reuse items as much as possible. Make my own cleansers without chemicals. I recycle my newspapers and milk jugs. I don’t have front door pick up so I have to take them to a site in town. If I had front door pick up I would recycle more. I got a Soda Stream and now put 36 less plastic bottles in the landfill every month! Lots of things! But, the most important one (to me, at least), is teaching my kids the importance of preserving our Earth and its creatures for future generations. We recycle and we cloth diaper. We use reusable water bottles and snack/sandwich bags. I always keep a couple filled water bottles in my fridge. I need a bottle to take with me on my adventures! One of my biggest green commitments is to not use any throw away products (like paper towels, plastic bags, plastic utensils or paper plates, water bottles, etc.). I have an assortment of reuseable bags, washable containers and bottles instead! I recycle and drink filtered water instead of using water bottles. I try to help the environment by recycling and using non-toxic products. I also try to conserve both energy and water and make donations to environmental causes. I am a composting maniac, everything that possibly can (including paper) goes in there, and my garden is terrific. The Rafflecopter calls me ‘Margot’ since it is accessing my facebook where I am ‘Margot Core’. We have a vegetable garden. We compost kitchen and yard waste. We use no chemical fertilizer. We rely on compost and composted manure from out animals. We recycle and shop organically!